From strolling along the Seine to watching the Eiffel Tower sparkle, Paris will simply take your breath away with every step you take. It could be a combination of the intoxicating smells from each boulangerie, mesmerizing views within each neighborhood, or the revolutionary history, you will soon discover that the city of light has a certain “je ne sais quoi” that captivates every world traveler. Get lost. Indulge in pain au chocolats. Immerse yourself in the rich culture that makes Paris unlike any other city. Close your eyes and dream of Paris. Okay, now open them, and you will arrive at Relais Christine. Located in St. Germain, the posh and intimate Left Bank, the hotel has the classic French interior, flowered courtyard, and spa to make it a girl’s dream. If you have followed some cool Parisian Instagramers (like @ParisinFourMonths or @journeyintolavillelumiere) to prepare for your trip, then you know Hotel Amour is one of the hottest stays in Paris. Located at the tail-end of the colorful Red Light district in Montmartre, this is the place for a darker and more “bobo” side of Paris. While in Montmartre, climb up Rue des Martyrs, a street that is reclaiming the area’s food scene with Rose Bakery and KB Coffee Shop. Now if you are looking for a killer deal, and want to live like a local Parisian, you will want to be here. This Airbnb is in an amazing location with a phenomenal rotisserie chicken shop, Marché Cours de Vincennes, and is close to the trendy areas, untouched by tourists. Here is another great Airbnb in a more central location. Want to get a full picture of Paris? Begin your trip by walking up the Champs-Elysees to visit L’Arc de Triomphe, giving you a 360° view of the City of Love, and will help you map out the rest of your stay. The picture-perfect panorama is definitely worth the 8 euros (and the 284-step climb!). You haven’t experienced true Parisian culture if you don’t have a picnic by the Seine or any patch of grass that you can lay a blanket on. To prepare for the perfect picnic, head to Marché Bastille for the best, local vegetables, fruit, meats, cheeses, and freshest baguettes. You will find me here every Sunday speaking Franglish with the vibrant vendors, bargaining for the best price. (Open Thursday and Sunday). If you want an amazing lunch that is made to order and filled with international flavors, you need to stroll to Marché des Enfants Rouges. A lovely 20-minute promenade through the Marais from Marché Bastille! If you’re traveling with a friend, one person should stand in line for Le Traiteur Marocain while the other is in queue at Chez Alain Miam Miam. The museums in Paris are the most strikingly beautiful structures in the world, bar-none. However, trying to narrow down art exhibits to visit can prove a difficult task. An absolute must-see is the Musee D’Orsay. Musée D’Orsay overlooks the Seine with these iconic, larger-than-life clocks on the exterior. Serving as a train station in the early 1900s, the museum now boasts the most wonderful paintings and sculptures of Vincent van Gogh, Claude Monet, and Auguste Rodin. Come here if you want be able to breathe, see the incredible golden clock in the grand hall, and avoid watching tourists take an embarrassing number of selfies with Mona Lisa. If you have checked off Luxembourg Gardens and the Tuileries Garden off of your list, it’s time to go down a side street off of l’Arc de Triomphe, and enter into the lesser known, Parc Monceau. This park will take you out of Paris and bring you to a lush, green oasis filled with Corinthian pillars, quaint bridges, and beautiful flowers. It’s a hidden gem that gives you some peace and quiet in the ever-bustling city. Explore through the Marais neighborhood to uncover the most classic cobblestone streets of Paris, filled with trendy boutiques, traditional patisseries, and incredible crêperies. The area has a wonderful Jewish quarter where you can purchase a falafel the size of your head at Chez Hanna, and people watch at Place des Vosges, one of the most beautiful squares in Paris. Paris takes their architecture seriously, and the Palais Garnier is no exception. If you’re a planner, snag tickets for an unforgettable night at the Opera. If you’re more of a last-minute traveler, you need to soak in the golden exterior and breathtaking interior of the legendary opera house. Paris is home to the best food, culture, and views in the world, but one key defining factor that sets the city far above the rest is haute couture. I encourage you to shop until you drop along Champs-Elysees, Rue St. Honore, Galeries Lafayette, Rue Francs Bourgeois, and Rue de Rivoli. When your feet and wallet need a rest, treat yourself to a glass of wine on the terrace at Pause Café (41 Rue de Charonne). If you come to Paris, you have certain food standards that need to be met: Buttery croissants, artisanal cheese, sweet crêpes, and this insane Lamb Shoulder at Chez Paul (13 Rue de Charonne). A traditional French bistro located in the heart of the Bastille neighborhood, the old-school vibe will make you feel that you are time traveling with Owen Wilson in Woody Allen’s Midnight in Paris. The service is legendary, and is a full dining experience that won’t break your bank. Try the “Maison Specialité,” the Rilette! 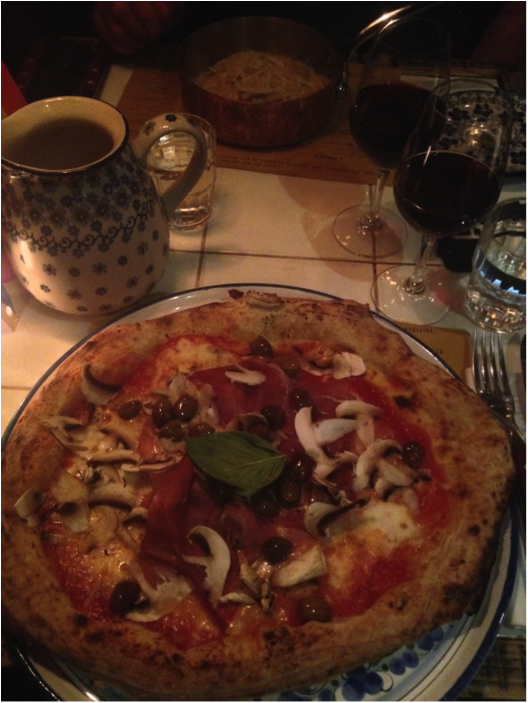 The trendiest Italian restaurant in Paris right now is Ober Mamma (107 Rue Richard Lenoir) for all the right reasons. The new resto is gaining popularity with it’s fun aperitivo, cozy yet contemporary atmosphere, and incredibly delicious food. Once you’re done indulging in their Truffle Pasta, head across the street to Rue Oberkamf for a fun night out! One does not speak of French restaurants without mentioning the legendary Relais d’Entrecote (20 Rue St-Benôit). For 26.50 euros, you will be served two generous portions of steak and fries. Once seated, you will be asked only one question: “How would you like your steak prepared?” The steak sauce is indescribable, they have their own house wine, and if you can squeeze in dessert, go for the Crème Brulee. For life-changing avocado toast, you need to check out Ob La Di (54 Rue Saintonge). Be prepared to cozy up to your neighbor in this new coffee shop in the Marais. The cool, teal tiles and hip, welcoming staff will make you feel like you’ve been living in Paris for months. Coffee fiend? Answer: Coutume Café (47 Rue de Babylone). These guys know their coffee, and have beans from all over the world. Their food is also unreal, and best part is you can grab a flat white and enjoy a 20-minute stroll to the Eiffel Tower. Early 2000’s hip-hop, best cocktails in Paris, and insanely charming bartenders (rocking boxers, bowties, and baskets) is what you will find at Le Calbar (82 Rue de Charenton). You will never have a bad experience here, and if you ask nicely, you can be the dj for the night. Newly opened, Gravity Bar (44 Rue des Vinaigriers) is getting tons of fame for their amazing interior, craft cocktails, and imaginative food. They put a lot of love into their drinks, with the waiting time being almost 20 minutes, but rest assured you will be feeling good after one sip. Badaboum (2B Rue des Taillandiers) is a fun night club that hosts some of the best DJs in the world. The different levels give you awesome vibes all around, and a light show that doesn’t stop until 5AM. Mauri7 (46 Rue du Faubourg Saint-Denis) is the Parisian take on a college bar that you would find in the U.S. with a foosball table, super cheap drinks, and a backdoor leading into an alley where you can hang with friends. Feeling super fancy? Hotel Costes (239-241 Rue Saint Honoré) is where you go to see and be seen. Take on Paris on two wheels, and I’m not talking the ever-popular Parisian scooter. Velib rental bikes are hands down best mode of transportation to see all of Paris! If you are more of an underground dweller, the Metro is for you. Look for the cool, gothic “Metropolitan” signs, and head down under to arrive quickly to new destinations. For a steal, you can purchase a “carnet,” a 10 pack of tickets, taking you wherever the City of Love inspires you. There are so many unbelievable things to do in Paris that when you return, try to take a day trip! The Palace of Versailles is a quick 45-minute train ride from Paris, and you can see what it’s like to live like royalty for the day! 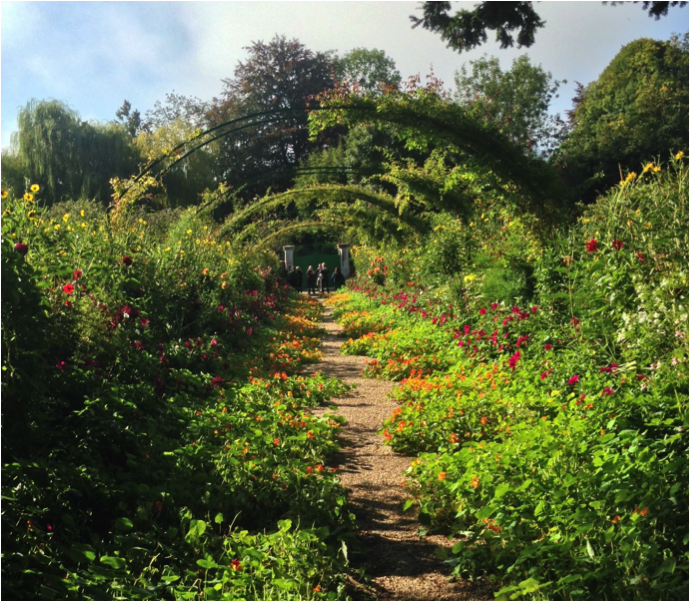 If you’re traveling in the spring or beginning of fall, Giverny is an incredible day trip to stroll through Monet’s gardens, and is only an hour train ride away from Paris. What do you love in Paris?